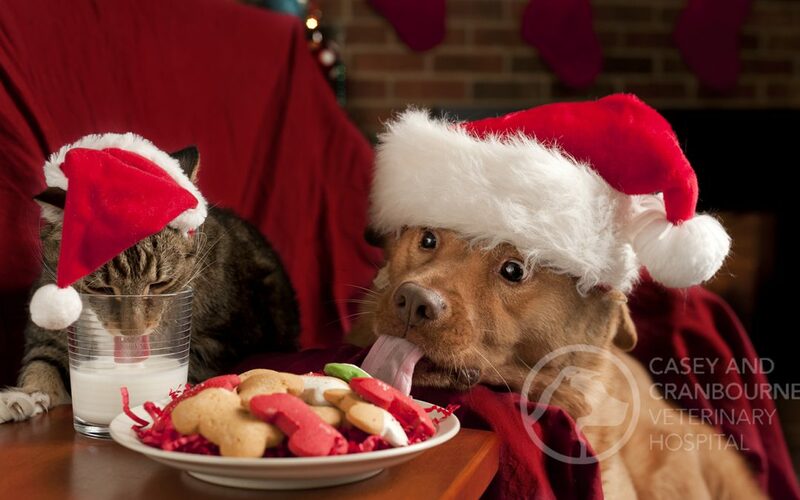 12 Common Dangers for Pets at Christmas! Macadamia nuts are enjoyable all year round but they tend to be more common during this time of year. Macadamia nuts are toxic to dogs and cause hind limb lameness, pain and weakness. Even before they’re out of the shell they can pose a threat to your dog and could result in a serious bowel obstruction. Despite the characteristic image of a dog playing fetch with a stick, it is not uncommon to see terrible injuries to the back of dogs’ throats when dogs accidentally run onto the stick as it lands on the ground. A stick can tear into the back of the throat and cause a horrible injury that is painful and difficult to explore and fix. Sometimes dogs might need to be referred for a CT scan to identify the extent of the wound and whether splinters are present. Much safer to buy your dog a Frisbee for Christmas! Yum! Who can resist chocolate? Most dogs can’t! Cats aren’t usually as curious about chocolate as dogs but it’s really important to keep chocolate away from both. Dogs and cats are VERY sensitive to the chemicals in chocolate. It can make them agitated and jittery, their hearts race dangerously fast, and can even cause seizures. Different types of chocolate present different dangers so please make sure only the humans enjoy it. In particular make sure children are aware as they may think they’re giving their pet a Christmas treat by offering them chocolate. Although we all love the flavour provided by these tasty veggies, they are dangerous for pets causing damage to red bloods cells in dogs and cats causing severe anaemia. This means they don’t have enough red blood cells to provide oxygen to their vital organs. They may be lethargic, have pale or even yellow gums and have rapid or difficulty breathing. While people sweat when they get hot, dogs can’t. Instead, dogs pant to regulate their temperature. Dog breeds with a short nose and noisy breathing such as Bulldogs, Pugs and French Bulldogs have more trouble panting effectively in hot or humid weather and can be at risk of heat stroke on hot days. Exercise during hot or humid weather during the summer months can put dogs at risk of overheating. It is important to avoid excessive exercise in the hottest part of the day. Signs of heat stroke include agitation, excessive and continuous panting, vomiting, diarrhoea and collapse. Despite their desert origins, cats also suffer from heat, in particular those breeds with flat faces such as Persian or Himalayan breeds, those with thick/long coats or overweight/obese cats. Excessive panting, agitation, vomiting, diarrhoea, weakness and collapse can be signs of heatstroke. Paralysis ticks are found on the eastern seaboard of Australia and are most common from spring to autumn. They can attach to dogs and cats and cause paralysis which can be life threatening. Signs include high-pitched bark in dogs, weakness or wobbly hind legs, retching and regurgitation and eventually complete collapse. Ticks are known to be in East Gippsland, as far south as Bairnsdale but there have been a few isolated cases in Melbourne and on the Mornington Peninsula in dogs who have not left the area. If you are planning on travelling to Gippsland or further up the eastern seaboard, it’s really important to come in to the clinic to discuss the best preventative tick products available. However, no product is 100% effective and there is no substitute for regular manual searches to detect and remove paralysis ticks. During the festive season there is plenty of alcohol around and while humans should drink responsibly, dogs and cats cannot be given alcohol. 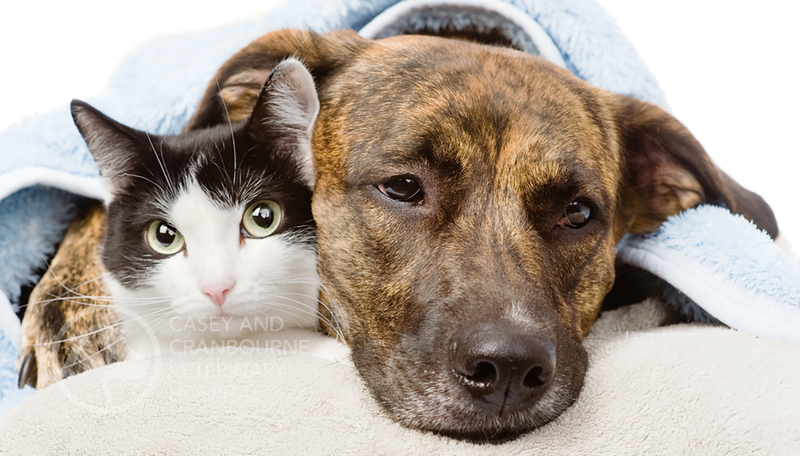 Dogs and cats are very sensitive to alcohol toxicity and even seemingly small amounts can cause death. Pets can also develop alcohol toxicity from eating uncooked rising bread dough, which can contain alcohol from the fermenting yeast. Grapes, raisins and sultanas are only toxic to some dogs, but there is no way of knowing which ones! Unfortunately, once they have eaten them, we have to assume they are going to be toxic, as there is no way of knowing until it is too late. Grapes cause the kidneys to stop working which can be life threatening. Christmas pudding is a rich source of raisins and sultanas so you should keep your dog’s away from this. 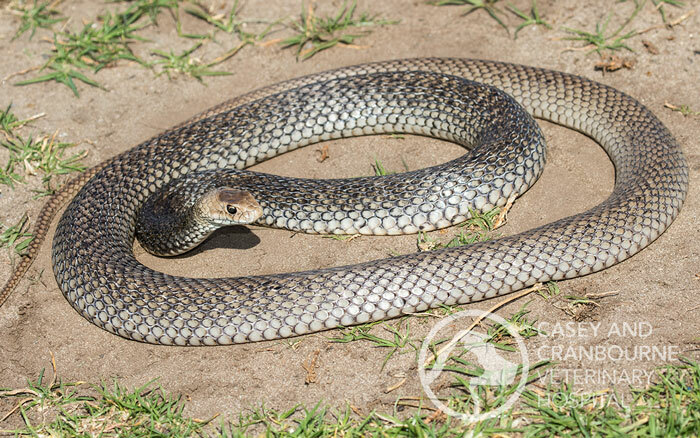 At this time of year people and pets are more active and so are snakes. It is very important to be aware of snakes in the local area and try to keep dogs and cats away from them. Signs of snakebite can develop within minutes to hours after the initial bite so always seek immediate veterinary advice if you suspect your pet has been bitten. Although a very pretty plant in the garden, the ‘Yesterday Today Tomorrow’ plant is severely toxic to dogs. Dogs seem to love the flavour, especially the seed pods, but it causes severe tremors and seizures. Often, affected dogs will pass the toxic seeds in their stool. Indoor flowers are popular decorations at this time of year but if you have cats then avoid Lilies. The orange-brown pollen inside the flower is highly toxic and can be fatal to cats. They don’t even need to eat it. Even if they walk under them and some pollen drops onto their coat, they’ll consume it when they groom themselves and this can lead to acute, irreversible kidney failure. Some dogs and a lot of cat’s love playing with Christmas decorations and this can lead to serious problems. Some decorations can be swallowed and lead to serious intestinal obstructions, which may require surgery. Some ingested Christmas foreign bodies that we have seen causing major problems include tinsel which causes the intestines to bunch dangerously, string bags full of chocolates, the string around the ham bone and even baubles! Christmas lights can also be a hazard because your pets can chew them, which can lead to electrocution. At this time of year there are numerous delicious treats around. Unfortunately, any rapid changes to your pet’s diet such as scavenging for scraps, means there is the potential for gastrointestinal upsets such as vomiting and diarrhoea. Fatty foods like barbeque scraps, turkey skin or pork crackling can lead to more serious pancreatitis. Major signs of pancreatitis are lethargy, poor appetite, abdominal pain, vomiting and fever. Despite the temptation to share these tasty treats with your pet, it’s important to avoid that and stick to their normal diet.